Affordable, high quality 'buds are hard to come by. For only $29 it's hard to pass on the Elise earbuds considering their build quality. It's even harder once you listen to a few podcasts or audiobooks on them as they were basically made to bring out the best in vocals. The downside is that it can make your music sound weird. The ADV.Sound Elise have a ceramic housing that give them a premium feel and look. When you think of audio companies, you probably think of the behemoths like Sennheiser or Bose. While you wouldn’t be wrong, there’s also a new and surprisingly good class of audio companies arising that are always worth paying attention to. One such company is ADV.Sound which first caught our attention with a pair of Bluetooth/wired earbuds. It’s moved on to make a Bluetooth speaker, some higher-end planar magnetic headphones, and numerous accessories, but now it’s returning to basics with a pair of affordable earbuds called the Elise for the person on the go. So has it struck gold again or is the company losing some of its steam? Podcast listeners. If you’re into podcasts and audiobooks, ditch the ‘buds that came with your phone and pick these up instead. You’re welcome. Anyone on a budget. At $29 these are a steal, even if you just keep them in your backpack for a rainy day. How are the Elise earbuds built? If you use these for commuting, you’re probably going to be rolling them up and tossing them in your pockets fairly often. As a pair of earbuds, the Elise is fairly minimal. They’re all black with a small, unobtrusive one-button control module on the cable connecting to the right earbud. The earbud housings, on the other hand, are made entirely of ceramic making these feel and look more premium than they probably are. They have a nice and weighty feel in the hands and in the ears, and the single red nozzle is a nice design choice as well. I wasn’t even really aware of it until I swapped the ear tips for the included foam ones and it shows the level of thought that went into the design. The ceramic housing is surprisingly thin and the single red nozzle is a nice touch. The drivers inside the ceramic housing are full-range micro drivers, and the cable leading to them is the only part of the earbuds that I’m not a fan of. After the Y-split, the cable is a thin plastic one that doesn’t seem like it will survive a hard tug. The slim cable looks nice, but if you accidentally get it snagged on something I don’t see it coming out of that. That said, the cable on the other end of the Y-splitter is great and manages to still remain fairly slim even with its braided fabric design. Plus, even though the connector is a hard plastic, there’s a soft rubber part to ease stress on the cable and prevent fraying over time. That will come in handy considering that ADV.Sound wants you to think of these as your “EDC on-the-go” earbuds, which means that they’ll spend a lot of time being tossed in your bag or quickly stuffed in pockets. To that end, they do come with a hardshell carrying case, but I found it way too big to comfortably carry in your pocket. If you want to carry some extra ear tips, a dongle, and a few other essentials, then it might be worth tossing this in your bag. However, if you just want to pick up your earbuds and walk out the door this carrying case seems a bit too bulky and, I never thought I’d say this, I’d almost prefer a cheap cloth one just for convenience. These have a 3.5mm connector which means they can plug into basically except, except some recent smartphones. While some newer smartphones don’t have a headphone jack anymore, these thankfully still come with the formerly universal 3.5mm connector. Of course, you’ll just have to use the included dongle with your device of choice if your phone is lacking a 3.5mm input. ADV.Sound also makes one of their own which doubles as a 24-bit/192 kHz DAC, but I didn’t use it for the purpose of this review since most people will probably just use the one that came with their phone. The single button remote is iOS compatible, meaning that if you have an Android device you can basically only pause/play music. As far as playback controls go these suffer from the same compatibility issue of most 3.5mm earbuds, which is that, much like AAC, they’re designed to work best with iOS devices. If you have one, you’ll be able to skip between tracks as well as pause/play music. As I have a Pixel 3, I was limited to only the ability to pause or play music by tapping the one-button remote. You can also access your devices personal assistant by long-pressing the button regardless of which OS device you have. There’s also a pretty decent microphone which will get the job done if you’re in a quiet, indoor space but I found that while using them outside people on the other end complained of wind and background noise. Still, for the price, it’s nice to have at all. While these do come with three pairs of silicone and foam tip each, I found isolation was lacking regardless of which you chose. As far as sound quality is concerned, I wasn’t expecting much. Usually, sub-$50 headphones tend to sound good enough for your average commute, but not anything to write home about. Unfortunately, that’s mostly true with these as well, but with a twist. While the bassline in the song Gave Your Love Away by Majid Jordan is fine, it’s lacking clarity. Some of the bass notes are a little hard to distinguish from each other. Then there are the lower-mids which sound drastically reduced, but that’s intentional. ADV.Sound made vocals in the mids the prominent focus of these earbuds. That means that vocals have no problem overcoming anything going on the low end to be clearly audible, to the detriment of some of that clarity I spoke about earlier. This is especially nice in songs where there’s a powerful vocal performance like 3:24 into the song Late Nights & Heartbreak by Hanna Williams & The Affirmations, but it’s probably not what you’re used to when it comes to earbuds. It almost sounds as if vocals are almost a little too emphasized when listening to music. That said, it’s spectacular if you’re like me and tend to listen to a lot of podcasts and audiobooks while commuting. Listening to Jim Dale narrate Harry Potter & the Sorcerer’s Stone through these sounded great, and the same is true with most of my podcasts. The one thing that I will note is that isolation isn’t great considering these have their own foam ear tips included in the box. More than once I had to rewind what I was listening to a few seconds due to a train passing. So back to the original question, did ADV.Sound strike gold again? I think it did. Podcasts are more popular than ever and I’m fairly certain it isn’t going to stop anytime soon. If you want a pair of earbuds that will make listening to your favorite podcasts that much more enjoyable, these are an easy recommendation. They have a great build, clear mid-range sound, and are passable for those random times when you do just feel like listening to some music. Best of all, they’re not unobtainable at only $29. Plus, ADV.Sound already makes numerous other earbuds for high-quality music listening. 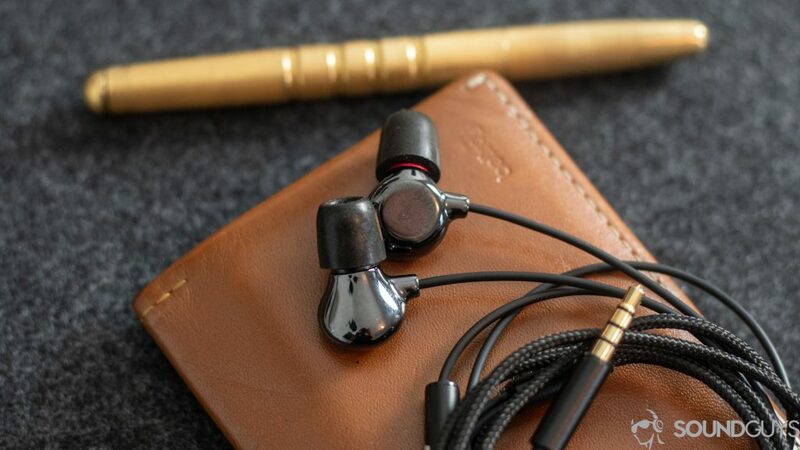 The ADV.Sound Elise is for a different type of listener, and if you’re one of those people these are a good pick-up whether they’re your main ‘buds or just the pair that you keep in your bag as a back-up.